Meditation techniques have been practiced for millennia. Originally, they were intended to develop spiritual understanding, awareness, and direct experience of ultimate reality. The many different religious traditions in the world have given rise to a rich variety of meditative practices. These include the contemplative practices of Christian religious orders, the Buddhist practice of sitting meditation, and the whirling movements of the Sufi dervishes. Although meditation is an important spiritual practice in many religious and spiritual traditions, it can be practiced by anyone regardless of their religious or cultural background to relieve stress and pain. As Western medical practitioners begin to understand the mind’s role in health and disease, there has been more interest in the use of meditation in medicine. Meditative practices are increasingly offered in medical clinics and hospitals as a tool for improving health and quality of life. Meditation benefits people with or without acute medical illness or stress. People who meditate regularly have been shown to feel less anxiety and depression. They also report that they experience more enjoyment and appreciation of life and that their relationships with others are improved. Out of this experience of emotional stability, one may gain greater insight and understanding about one’s thoughts, feelings, and actions. This insight in turn offers the possibility to feel more confident and in control of life. Meditation facilitates a greater sense of calmness, empathy, and acceptance of self and others. 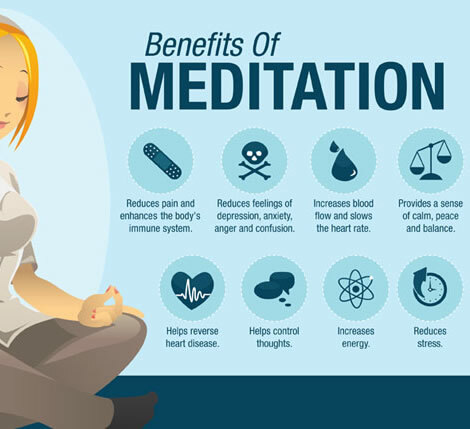 Based upon clinical evidence as well as theoretical understanding, meditation is considered to be one of the better therapies for panic disorder, generalized anxiety disorder, substance dependence and abuse, ulcers, colitis, chronic pain, psoriasis, and dysthymic disorder. It is considered to be a valuable adjunctive therapy for moderate hypertension (high blood pressure), prevention of cardiac arrest (heart attack), prevention of atherosclerosis (hardening of arteries), arthritis (including fibromyalgia), cancer, insomnia, migraine, and prevention of stroke. Meditation may also be a valuable complementary therapy for allergies and asthma because of the role stress plays in these conditions. Meditative practices have been reported to improve function or reduce symptoms in patients with some neurological disorders as well. These include people with Parkinson’s disease, people who experience fatigue with multiple sclerosis, and people with epilepsy who are resistant to standard treatment. A study of health care professionals published in 2002 indicates that the majority of physicians, nurses, and occupational therapists in the United States accept meditation as a beneficial adjunct to conventional medical or surgical treatments. Sitting meditation is generally done in an upright seated position, either in a chair or cross-legged on a cushion on the floor. The spine is straight yet relaxed. Sometimes the eyes are closed. Other times the eyes are open and gazing softly into the distance or at an object. Generally speaking, there are two main types of meditation. These types are concentration meditation and mindfulness meditation. Concentration meditation practices involve focusing attention on a single object. Objects of meditation can include the breath, an inner or external image, a movement pattern (as in tai chi or yoga), or a sound, word, or phrase that is repeated silently (mantra). The purpose of concentrative practices is to learn to focus one’s attention or develop concentration. When thoughts or emotions arise, the meditator gently directs the mind back to the original object of concentration. Mindfulness meditation practices involve becoming aware of the entire field of attention. The meditator is instructed to be aware of all thoughts, feelings, perceptions, or sensations as they arise in each moment. Mindfulness meditation practices are enhanced by the meditator’s ability to focus and quiet the mind. Many meditation practices are a blend of these two forms. The study and application of meditation to health care has focused on three specific approaches: 1. transcendental meditation (TM); 2. The “relaxation response,” a general approach to meditation developed by Dr. Herbert Benson; and 3. mindfulness meditation, specifically the program of mindfulness-based stress reduction (MBSR) developed by Jon Kabat-Zinn. TM has its origins in the Vedic tradition of India and was introduced to the West by Maharishi Mahesh Yogi. TM has been taught to somewhere between two and four million people. It is one of the most widely practiced forms of meditation in the West. TM has been studied many times; these studies have produced much of the information about the physiology of meditation. In TM, the meditator sits with closed eyes and concentrates on a single syllable or word (mantra) for 20 minutes at a time, twice a day. When thoughts or feelings arise, the attention is brought back to the mantra. According to Charles Alexander, an important TM researcher, “During TM, ordinary waking mental activity is said to settle down, until even the subtlest thought is transcended and a completely unified wholeness of awareness is experienced. In this silent, self-referential state of pure wakefulness, consciousness is fully awake to itself alone..” TM supporters believe that TM practices are more beneficial than other meditation practices. A group of Australian researchers has recently recommended TM as a preventive strategy for heart disease. In order to elicit this response in the body, he teaches patients to focus upon the repetition of a word, sound, prayer, phrase, or movement activity (including swimming, jogging, yoga, and even knitting) for 10–20 minutes at a time, twice a day. Patients are also taught not to pay attention to distracting thoughts and to return their focus to the original repetition. The choice of the focused repetition is up to the individual. Instead of Sanskrit terms, the meditator can choose what is personally meaningful, such as a phrase from a prayer. Mindfulness meditation comes out of traditional Buddhist meditation practices. Psychologist Jon Kabat Zinn has been instrumental in bringing this form of meditation into medical settings. In formal mindfulness practice, the meditator sits with eyes closed, focusing the attention on the sensations and movement of the breath for approximately 45–60 minutes at a time, at least once a day. Informal mindfulness practice involves bringing awareness to every activity in daily life. Wandering thoughts or distracting feelings are simply noticed without resisting or reacting to them. The essence of mindfulness meditation is not what one focuses on but rather the quality of awareness the meditator brings to each moment. According to Kabat-Zinn, “It is this investigative, discerning observation of whatever comes up in the present moment that is the hallmark of mindfulness and differentiates it most from other forms of meditation. The goal of mindfulness is for you to be more aware, more in touch with life and whatever is happening in your own body and mind at the time it is happening that is, the present moment.” The MBSR program consists of a series of classes involving meditation, movement, and group process. There are over 240 MBSR programs offered in health care settings around the world. Meditation appears to be safe for most people. There are, however, case reports and studies noting some adverse effects. Thirty-three to 50% of the people participating in long silent meditation retreats (two weeks to three months) reported increased tension, anxiety, confusion, and depression. On the other hand, most of these same people also reported very positive effects from their meditation practice. Kabat-Zinn notes that these studies fail to differentiate between serious psychiatric disturbances and normal emotional mood swings. These studies do suggest, however, that meditation may not be recommended for people with psychotic disorders, severe depression, and other severe personality disorders unless they are also receiving psychological or medical treatment. The scientific study of the physiological effects of meditation began in the early 1960s. These studies prove that meditation affects metabolism, the endocrine system, the central nervous system, and the autonomic nervous system. In one study, three advanced practitioners of Tibetan Buddhist meditation practices demonstrated the ability to increase “inner heat” as much as 61%. During a different meditative practice they were able to dramatically slow down the rate at which their bodies consumed oxygen. Preliminary research shows that mindfulness meditation is associated with increased levels of melatonin. These findings suggest a potential role for meditation in the treatment and prevention of breast and prostrate cancer. Despite the inherent difficulties in designing research studies, there is a large amount of evidence of the medical benefits of meditation. Meditation is particularly effective as a treatment for chronic pain. 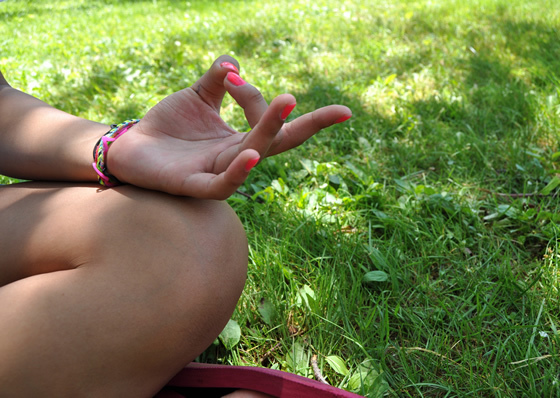 Studies have shown meditation reduces symptoms of pain and painrelated drug use. In a four-year follow-up study, the majority of patients in a MBSR program reported “moderate to great improvement” in pain as a result of participation in the program. 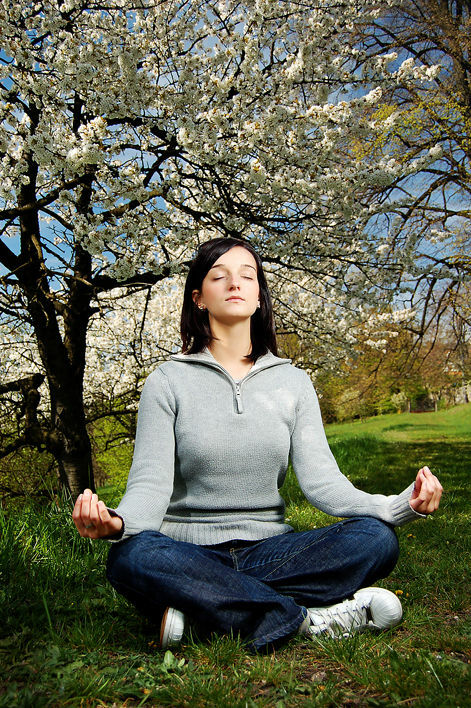 Meditation may also be an effective treatment for coronary artery disease. A study of 21 patients practicing TM for eight months showed increases in their amount of exercise tolerance, amount of workload, and a delay in the onset of ST-segment depression. Meditation is also an important part of Dean Ornish’s program, which has been proven to reverse coronary artery disease. Studies also imply that meditation is helpful in reducing symptoms of anxiety and in treating anxiety-related disorders. Furthermore, a study in 1998 of 37 psoriasis patients showed that those practicing mindfulness meditation had more rapid clearing of their skin condition, with standard UV light treatment, than the control subjects. Another study found that meditation decreased the symptoms of fibromyalgia; over half of the patients reported significant improvement. Research by a group of ophthalmologists indicates that nearly 60% of a group of patients being treated for glaucoma found meditation helpful in coping with their eye disorder. In addition, meditation was one of several stress management techniques used in a small study of HIV-positive men. The study showed improvements in the T-cell counts of the men, as well as in several psychological measures of well-being.